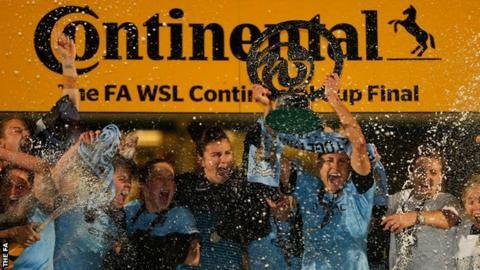 Holders Manchester City or Arsenal will host Birmingham City in the semi-finals of this year's Women's Continental Cup. Liverpool will host FA Cup finalists Notts County in the other semi-final, with the dates for both ties in October still to be confirmed. Three-time winners Arsenal's quarter-final with City was postponed after City were charged with fielding an ineligible player in the group stage. The charge was found to be unproven and the tie is still to be re-arranged. Two-time finalists Birmingham knocked out Women's Super League One leaders Chelsea in the last eight. Liverpool thrashed Bristol Academy in the quarter-finals, while Notts saw off WSL 2 side Reading. The final of the cup, now in its fifth year, will be held at Rotherham's New York Stadium on Sunday, 1 November.